Is 'Hovering' the Future of Online Cause Marketing? Swoop is a new online content service that expands the potential for web pages to deliver deeper engagement with users. When you hover over keywords or icons additional content is revealed without ever leaving the page. Right now the service is just being used with food and recipes, but cause marketing could be next. Say the online grocer Peapod in New York uses Swoop and when visitors scroll over certain products a window opens with information on The Food Bank for New York City and how a portion of sales from that product will feed the hungry. Another example is when you view Starbucks coffee products online Swoop shares additional info on the coffee makers fair trade practices or its support for Product RED. What's cool is consumers don't have to leave the page their viewing to get more information. It all happens on the page they're on. And what they see isn't a generic pop-up. The information is personalized by Swoop based on the viewer's location and search history. So instead of just getting generic information on a cause, the user could get customized information on local causes and programs that will benefit from their support. The viewer can also share the page on social networking sites, such as Facebook and Twitter. This could be easily turned into an action-triggered donation program that has businesses rewarding causes when products and services are shared on social networks. It's a good idea that that was originally part of Endorse for a Cause but never took off. Swoop is not the first and won't be the last visitor to this space. A Techcrunch post on Swoop points to Apture, which was recently acquired by Google. The point for nonprofits is that online cause marketing with services such as Swoop represent a new opportunity for engagement and revenue. Nonprofits can prepare for hovering pages now by developing an online content strategy for cause marketing partnerships that will be ready to go when hovering becomes a habit. I've made it my mission of late to find good online cause marketing options for small companies and causes. Thanks to the Cause Marketing Forum Conference, I've discovered two more. I'm a little embarrassed that I'm just learning of MissionFish and Benevity. But better late than never, right? MissionFish, which was just acquired by eBay in May, has a tagline that says it all: "The way to fundraise on eBay." There are several ways to use MissionFish within eBay. Nonprofits can sell in-kind items online and collect the money. eBay users can also make a donation directly to the nonprofit via PayPal. Finally, eBay sellers can list any item for sale and have a portion or percentage donated to a nonprofit. MissionFish's services are a great thing to promote within your organization with staff, volunteers and donors. They can sell items on eBay and your nonprofit will benefit! I'm curious if a company has ever used MissionFish to raise money for a cause. We know that a cause can sell things on MissionFish and earn a donation, but can a company do it for them? For many years, HomeGoods, a national chain of home design stores, donated home furnishings to our annual silent auction. We raised some good money auctioning off those fashionable pillows, lamps and rugs. HomeGoods only donated once a year, but what if it was willing to set up a small online store with MissionFish so they could sell surplus items for us throughout the year? This would give businesses like HomeGoods greater exposure beyond our one night silent auction. I'll ask MissionFish co-founder Clam Lorenz to answer this question in the comments. The best thing about MissionFish, of course, is that it has the backing of eBay users. You have an instant audience of engaged buyers! That's powerful. Regardless of whether the cause or company does the selling, MissionFish is a tool I would add to your cause marketing toolbox. MissionFish is also cause marketing approved. MissionFish and eBay have won not one but two Cause Marketing Halo Awards. And with good reason. eBay users have raised more than $230 million with MissionFish. But what if HomeGoods doesn't want to sell their products for a cause on eBay? What if they want to suppot good causes right from their own online shopping site? [It's a hypothetical question as HomeGoods doesn't currently have an online store.] That's when HomeGoods calls Benevity. Using Benevity, any retailer can turn their online shopping site into a charitable giving machine. A portion or percentage can be donated to good causes, or shoppers can add a donation at checkout, if they choose. Since it operates outside of the eBay platform, Benevity offers more flexibility and options for partners. They can offer real-time matching offers and charitable gift cards to motivate consumers to give, among other things. Benevity also allows shoppers to choose their cause from 750,000 charities in the United States and 85,000 in Canada. 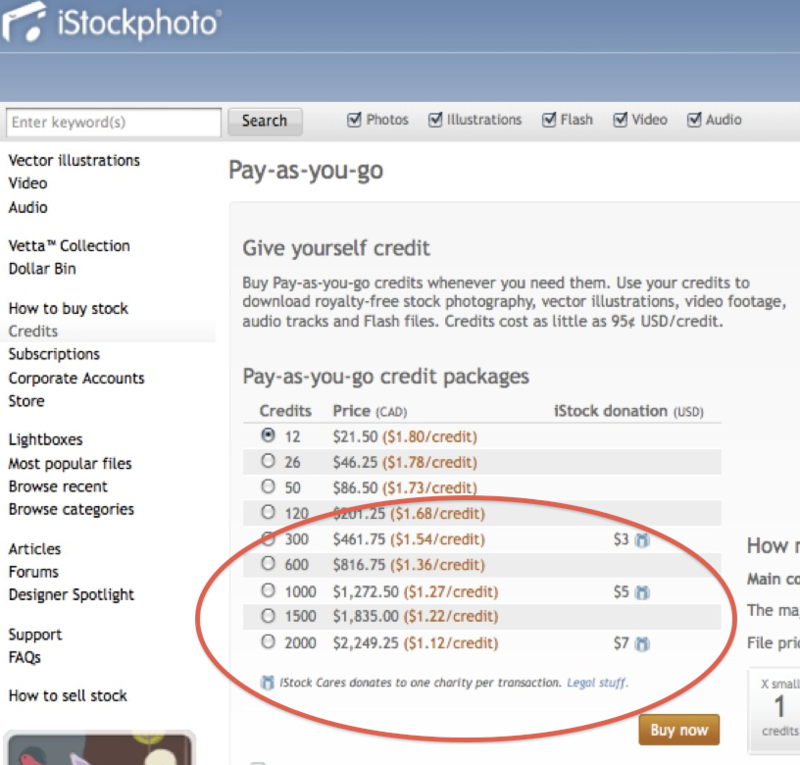 Check out how iStockPhoto is using Benevity as an online cause marketing platform. Purchases from shoppers trigger a donation from the photo site. According to Benevity, the next step is for iStockphoto is to allow photographers to differentiate their imagery by whether it gives back, enabling a portion of the purchase price or royalties to be directed to charities chosen by buyers and sellers. This is ideal. The company donates when consumers buy credit packages, but individual users can leverage the platform to support causes about which they care. I suspect the question you have about online giving is the same one I have for MissionFish and Benevity. This works well with large, established companies and causes - like the example of iStockphoto for Benevity, or Goodwill for MissionFish. But are both platforms truly easy, affordable and effective for the small businesses and nonprofits that are eager to use online shopping sites for good? That's one question I'm hoping Clam at MissionFish and Jana Taylor at Benevity can answer for us. I also want to hear from you! Where Are All the Online Cause Marketing Solutions? How would you like to be in my book Cause Marketing for Dummies? Here's what I'm looking for. I have a whole chapter devoted to online cause marketing. Within it, I want a section for e-tailers and other online businesses that want to partner with and raise money for causes online. When I first outlined the section, I had a couple good ideas in mind. The first was Change Round-Up, about which I wrote gushingly a while back. Before shoppers check out online they're asked to make a donation. Online point-of-sale! But the last time I talked to the owner of Change Round-Up he said he was shuttering the business. Too bad. The other online solution I hope to include in my book was Endorse for a Cause, about which I've also positively written. EFAC's online widget on individual web pages allows shoppers to share brands and products with their friends over Twitter and Facebook, triggering a donation to their favorite causes. Great idea. But when I did a random search for its badge on its partners websites I didn't find any. Maybe I didn't look hard enough. But maybe EFAC is a great idea whose time has not yet arrived. So I went back to the drawing board and looked for some online cause marketing solutions that would work for causes and companies. I really like Beanstalk Giving, which seems to be the successor to Change Round-Up. Like the latter, Beanstalk has a web tool that allows shoppers to add a little extra, either by rounding-up their change or adding $2-$3 to their total - which then goes directly to a charity of the donor’s choice. Another idea is Katchingle which allows you to make micropayments for online content. According to the site, you can put a Kachingle medallion on anything (e. g. site, blog, individual page, app). After a user sets up an account they can make small recurring payments wherever they see the medallion. They can also see who else is making payments. Cool. This could be applied to online cause products. Similar to Endorse for a Cause, shoppers wouldn't have to buy the item, they could just Kachingle an environmental cause when they visit Timberland and Patagonia online. Kachingle could also be used on nonprofit web sites for donors to make small donations when they see or read content that resonates with them. Every cause video on Youtube should have a Kachingle medallion! The challenge is, of course, that most people have no idea what Kachingle is. I didn't until three days ago. As one author wrote last September, "A year and a half after the Internet first started buzzing about it, Kachingle hasn’t really caught on." That might be an understatement. But I hope Kachingle and online cause marketing does catch on. An extra jingle of coins for nonprofits when so many are struggling would be a welcome sound.